One of the most distinctive Sporting breeds, the mahogany red Irish Setter is an active, aristocratic bird dog. Originally bred to be red and white, the solid red color appeared in Ireland the 19th century and became a mark of quality and superior sporting ability. Over two feet tall at the shoulder, the Irish is known for his style, powerful movement and clown-like personality. The Irish Setter became popular in the 18th century throughout Ireland and the British Isles. Developed from a mix of Irish Water Spaniel, Irish Terrier, English Setter, Spaniel, Pointer, and a dash of Gordon Setter, the breed was originally used to “set” game, crouching low near the birds so that the hunters could walk up and throw a net over bird and dog. When firearms were introduced, the Irish adapted into a gun dog that pointed, flushed and hunted in an upright stance. 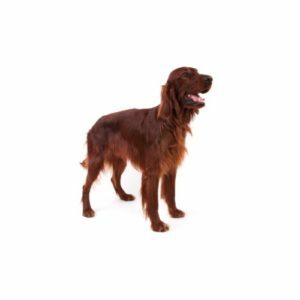 A rollicking breed, the Irish Setter is high-energy and requires regular exercise. His outgoing and stable personality make him a favorite with families. Their long, glossy red coat, although beautiful, must be groomed regularly to prevent snarls or mats. Average size: 60 to 70 pounds and 25 to 27 inches tall at the shoulder. Are you interested in purchasing a Irish Setter?